A must-have for every Canadian nursing student, Mosby’s Comprehensive Review for the Canadian RN Exam is the perfect preparation tool, offering not only hundreds of practice questions, but also a full review of nursing content to help answer those questions. As the only fully Canadian comprehensive review book on the market, you will find the specific nursing knowledge you need for anyone preparing to write the CRNE. The all-Canadian author team and cross-country contributors have ensured the appropriateness and relevance of all the material covered. Designed to prepare you to write the Canadian Registered Nurse Examination (CRNE), the text features 11 chapters, 2 practice exams and 6 appendices, along with a CD-ROM containing the practice examinations in electronic format with answers and rationales for each question. 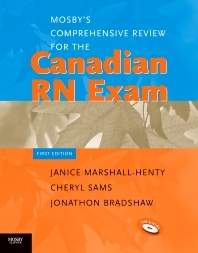 The introductory chapters explain how best to utilize this comprehensive resource as a study tool, moving on to the pertinent details about the Canadian Registered Nurse Examination (CRNE) itself, with tips on how to successfully prepare for and write the exam. The content review chapters are followed by topical practice questions. Each question has an answer and rationale provided to allow you to fully assess your mastery of the content. Can’t wait? Buy Mosby's Comprehensive Review for the Canadian RN Exam in your campus bookstore today!